Ever been in a love-hate relationship? Ever been in a love-hate relationship? I have. Ever since 2006, when I bought my first custom built guitar. I'm not going to mention the luthier's name, because I don't want to cause any embarrassment or dismay. Besides, the problems were/are as much due to me as they were to the luthier. The old saying "A camel is a horse designed by committee" is totally apropos. And I certainly served on that camel committee! I guess it's no secret that my two guitar heroes are Eddie Lang and Django Reinhardt, so my dream guitar has always been one that will make me sound just like Eddie on rhythm! and just like Django on lead...! Ha ha! 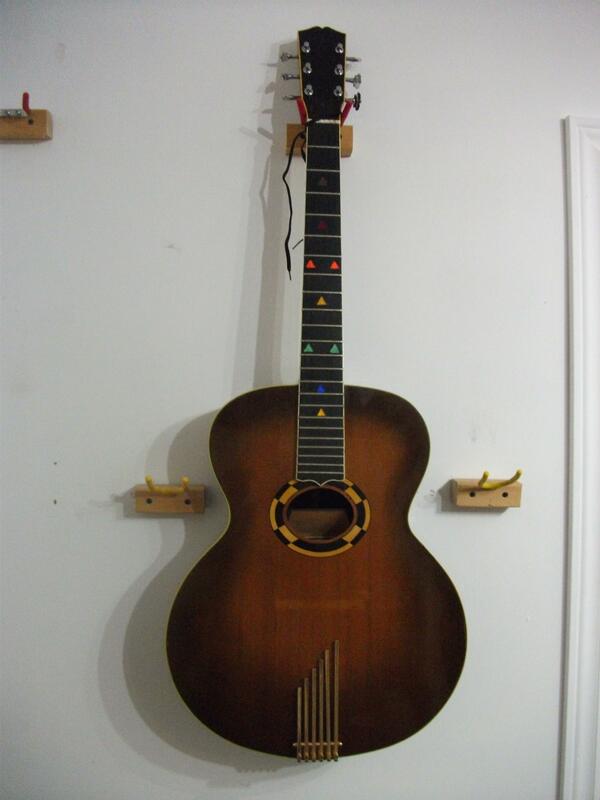 Besides those two very reasonable requests, I ALSO wanted my dream guitar to look like an art deco masterpiece! Surely that's not asking too much, is it? So I chose this luthier that makes gyspy guitars but has also made some really beautiful art deco-themed guitars. 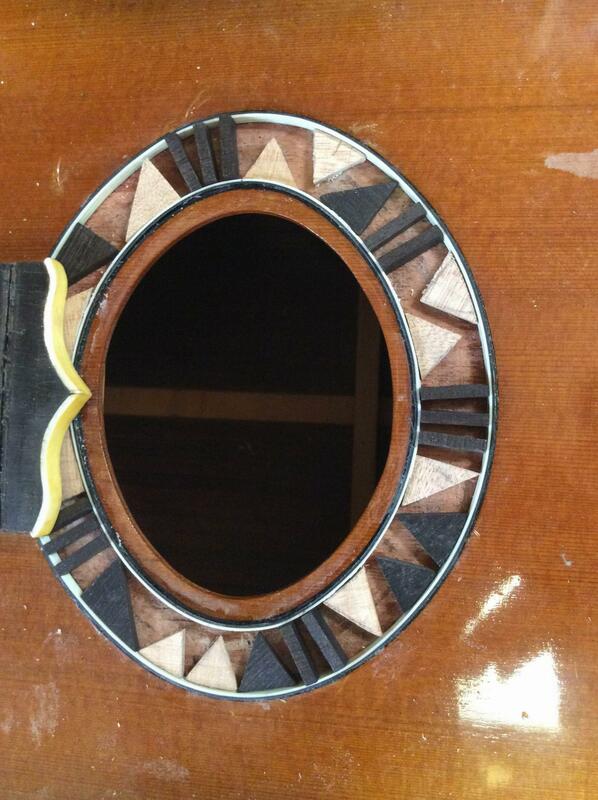 We kind of collaborated on the design of the guitar... the same dimensions as Lang's oval hole L-4 Gibson, but with its top braced like a gyspy guitar, and some art deco stylings rather than copying the Gibson inlays and rosette. The luthier also has experience building guitars with a smaller interior soundbox, along the lines of the metal resonator in 1930's Selmacs. And foolish me, I thought THAT would be great! When the guitar finally arrived, I was kind of disappointed. I hated ALL the art deco stylings... my stained glass inlays turned out to stupid looking, and I took an immediate dislike to the rosette pattern the luthier had designed and executed... it reminded me of somehow of a Batman villain! Plus, the guitar was a real mixed bag acoustically--- a nice treble and dreadnought-ish deep bass, but practically zero midrange---!!! After playing it for a few years, I got so depressed about it that I put it away in the case and bought myself a little blonde F-hole Castellucia from Michael Horowitz. Truthfully, I'd pretty much forgotten all about expensive elephant in my music room and chalked it up to the 'experience' file when a fellow guitarist friend of mine offered a radical suggestion: why not take the guitar to a local luthier and have him just remove the interior sound box? Because even if that didn't improve things, surely I'd be no worse off than I was before, would I? Wow! I'd never thought of that! So I did it, and WOW--- what a difference! Because NOW the guitar sounds like the guitar I always dreamed of... well, I'm going to let you listen to it for yourself, see the attached MP3. It DOES sound like Lang for rhythm and Django for lead--- although I confess that the skill level of the instrument's player never quite makes it to that exalted company! I still hate the looks of it though. So next month I have booked a major cosmetic overhaul. 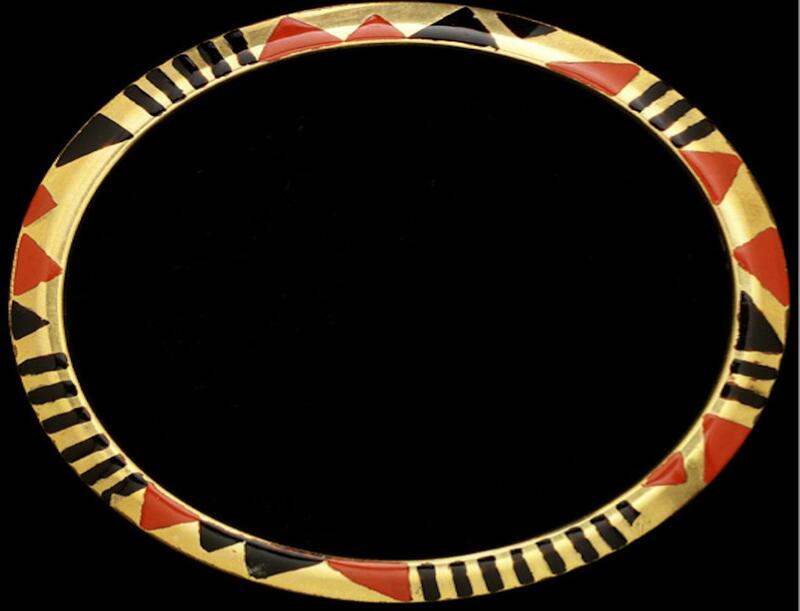 I'm getting a new rosette, based on an art deco bracelet I saw in London's Victoria and Albert Museum... and a brand new inlay-less fingerboard. Who knows, in the future I may have some art deco inlays installed. At present I'm thinking along the lines of the beautiful art deco plates and teapots of 20th century English artist Clarice Cliffe. Moral of the story... yes! you CAN find the guitar of your dreams... IF you are crazy enough to keep spending and spending and spending! PS The attached MP3 file is a live performance of a tune that our trio was playing for the first time... please pay no attention to all the silly flubs and just listen to the beautiful tone of that guitar! I like your story and both your humility and outrageous desires. I've got nothing to match it, but I've got two custom built guitars (an OM and a Selmac) I bought. Both suffered after I got them from my misdirected worry. I warmed up to them after 10 years and 2 years respectively and they now sit next to my chair as 2 of 3 that I play all the time. I simply don't judge guitars well enough until a period of time has elapsed. It isn't for lack trying. Good luck on your wonder weapon. Don't be to hasty! Will, I'm not sure I like the new rosette any more than the old one, in fact, I prefer the old one. 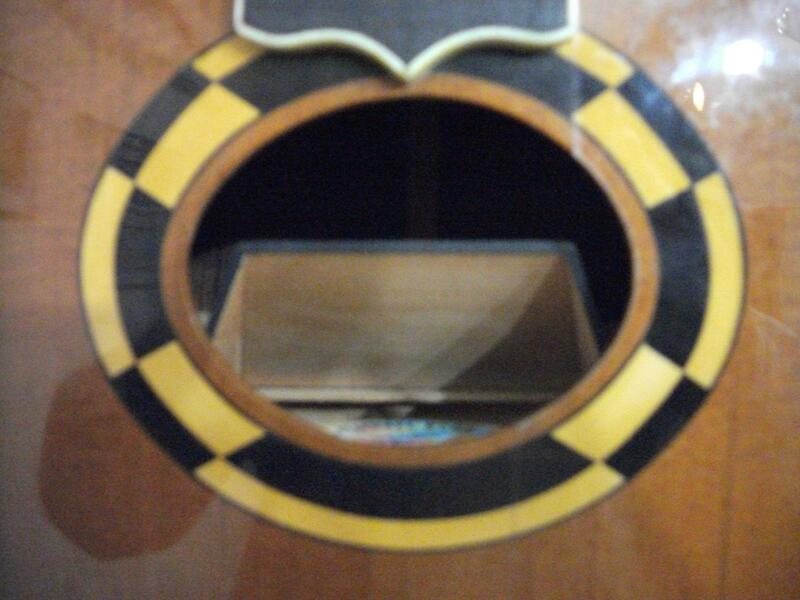 Can't they just fill in the fingerboard inlays rather than replace the fingerboard? Good luck, nice playing and I do like the sound. Someone touched upon the subject in another thread. As I recall, it had to do with a guitar that moved a lot with changes in humidity. That is definitely an important factor. But there are others. Anyway, I totally agree with Jeff above. You shouldn't give up too fast. It can take years. Will, I'm not sure I like the new rosette any more than the old one, in fact, I prefer the old one. Hmm, very interesting and unexpected, Jon. The truth is that I've put so much emotion into hating the old one that I'm not sure how to respond, except to say that I like the new one better, and I'm the guy who's going to be looking at it every day! I dig it all!!! Very cool! I have to say I kinda like the original rosette, but the new one looks pretty good too. When Michael Dunn built my Ufox, I picked the wood gave him the neck dimensions and gave him a free hand design wise. It came with a transverse oval hole which looks way cool to me. I like the rosette too. The fret markers are weird, remind me of some sort of 80s electronic toy. I'm glad I'm not the only one who enjoys the old rosette. If only it had a bit more of the dark color, and wasn't so blond.... Again, nice playing Will! Nothing has been glued in yet, and the little triangles that are presently white are going to be stained red, but this is roughly how its going to look. Although several posters said you actually preferred the old rosette, as you can see, I've disregarded your advice, and there's no accounting for taste but... this one puts me right on Nuage Neuf... so I'm glad I went for it.